Dinwiddie County is a county located in the U.S. state — officially, "Commonwealth" — of Virginia. Dinwiddie County was established May 1, 1752, from Prince George County. The county is named for Robert Dinwiddie, Lieutenant Governor of Virginia, 1751-58. However, the first inhabitants of the area were in fact Paleo Indians, prior to 8000BC. They are believed to have been nomadic hunter-gatherers following of animal migrations. Early stone tools have been discovered in various fields within the county. The county raised several militia units that would fight in the American Revolution. During the Civil War, the Battle of Lewis's Farm, fought along Quaker Road (present-day Rt. 660) occurred on 29 March 1865, this was the first in a series of attempts by Grant's army to cut Lee's final supply line -- the South Side Railroad -- in spring 1865. Here the Union forces led by Brig. Gen. Joshua L. Chamberlain engaged Confederates under Maj. Gen. Bushrod R. Johnson. After sharp fighting, the Union troops entrenched nearby along the Boydton Plank Road and Johnson withdrew to his lines at White Oak Road. After capturing Five Forks on 1 April 1865, the Union army cut the rail line. The following morning at approximately 4:40 a.m., Lieutenant General Ulysses S. Grant forwarded the Sixth Corps, some 14,000 strong, pouring over the Confederate fortifications near Tudor Hall Plantation (currently preserved by Pamplin Historical Park). The Dinwiddie County Historical Society currently occupies the old historic Dinwiddie County Court House. 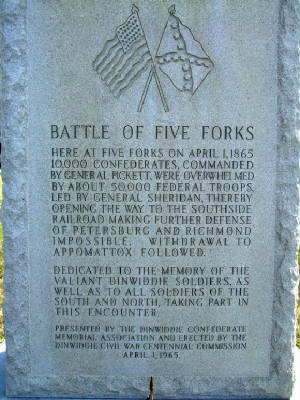 This attack broke General Robert E. Lee's defensive line around Petersburg, during the Siege of Petersburg, and compelled Lee to order the evacuation of Petersburg and Richmond that night. Lieutenant General Ambrose Powell Hill, one of Lee's highest-ranking subordinates, was killed near what is now Pamplin Historical Park while riding to take command of the battlefield. Several other engagements were fought in Dinwiddie County including the Battle of Dinwiddie Court House, Battle of Sutherland's Station, and Battle of White Oak Road.